Green Bay Packers tackle David Bakhtiari stretches during organized team activities. GREEN BAY, Wis. — Right guard T.J. Lang is optimistic a starting offensive line that hasn’t been on the field together in seven months can jell in time for the start of the Green Bay Packers’ season. "We haven’t all been out there, but I don’t think there’s any concern that we’re going to lose any chemistry," Lang said Tuesday. "Us five, we’ve played a lot of football together, and we trust each other, we know what we’re doing." The Packers have had their preferred starting five since 2014, but this could be their last year together. Contracts for three starters are up after this season, and the team has some options in reserve after taking two linemen in this year’s draft. After missing the first week of training camp and then practicing in limited fashion last week, Lang felt a sense of urgency to be more active when the team returned to the practice field Tuesday night following the canceled Hall of Fame game two days earlier. The eighth-year pro, who spent the entire offseason recovering from surgery for a torn labrum, looked forward to participating in team drills this week and playing in the Packers’ first preseason game Friday against the Cleveland Browns. "My shoulder feels healthy, I feel healthy, and I’m just ready to go back in there and settle back in at my spot," Lang said. "I’m a competitive guy, it’s hard standing out there watching somebody else take your reps every single day." Lang, left tackle David Bakhtiari and Pro Bowl left guard Josh Sitton are entering the final year of their contracts, barring an extension from the team. Of the starting five linemen, only Sitton played every game last season, which was marred by a slew of injuries. The Packers are still waiting to have all five together again for the first time since the playoff loss to the Arizona Cardinals on Jan. 16. Third-year center Corey Linsley remains on the physically unable to perform list because of a hamstring injury. Veteran right tackle Bryan Bulaga, who has dealt with knee injuries the past few years, also has missed some practice time early in camp, including Tuesday. Coach Mike McCarthy and quarterback Aaron Rodgers aren’t overly concerned about the shaky health of the offensive line. Fourth-year pro JC Tretter, who has been filling in for Linsley with the starting group, didn’t practice Tuesday because of illness. Rodgers said the impact on continuity with the start of the season still a month away is very minimal. "Just want those guys healthy for Week 1," Rodgers said. NOTES: Three of the team’s remaining five players on the PUP list returned to practice Tuesday: WR Ty Montgomery, TE Jared Cook and LB Sam Barrington. Veteran WR Jordy Nelson (knee) remains out, along with Linsley. 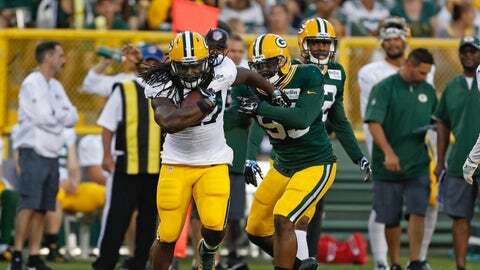 … RB Eddie Lacy practiced after missing time last week with an ankle injury. Still out are QB Brett Hundley (ankle) and LB Jake Ryan (hamstring). … The Packers signed long snapper Jesse Schmitt, an undrafted rookie from Purdue, and released LB Manoa Pikula. McCarthy said Schmitt was added to provide competition for incumbent long snapper Rick Lovato, a first-year pro. … Former NFL coach Tom Coughlin visited the Packers on Tuesday and stayed for practice. Coughlin, 69, was recently hired as the league’s senior adviser to football operations. Coughlin had his 12-year tenure end as New York Giants coach after last season. "It’s strange, it’s strange, but that’s the way it is," Coughlin said of his new role, as he exited the practice field Tuesday night.